Dr Kelly Greenop is a senior lecturer within the School of Architecture and is affiliated with both the Architecture Criticism Theory History (ATCH) and Aboriginal Environments Research Centres (AERC) within the School. 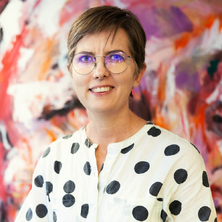 Her research has focused on work with Aboriginal and Torres Strait Islander people in urban Brisbane, using ethnographic techniques to document the place experiences and attachment, and the importance of architecture, place, family and country for urban Indigenous people. She also conducts research into the intercultural place heritage of the Brisbane region, and the urban cultural history of Brisbane’s suburbs. Kelly's latest research is in Digital Cultural Heritage, utilising 3D laser scanning of heritage environments and buildings in South East Queensland. She has been working with researchers from ATCH, School of Architecture, CSIRO and site managers at Queensland Parks and Wildlife Service to scan and archive fragile, remote and at risk sites, and research the use of scanning in architectural heritage practice. With colleagues from AERC she has also conducted research into Aboriginal housing, particularly with respect to crowding and homelessness. Kelly’s research has been supported by grants from the Australian Institute of Aboriginal and Torres Strait Islander Studies (AIATSIS), the Queensland Government, the Australian Federal Government and the Australian Housing and Urban Research Institute (AHURI). Kelly's research has often focused on the implications of housing policy and management for Australian Aboriginal and Torres Strait Islander peoples. This has been funded by the Federal Government and formed the basis of several policy bulletins for practitioners and policy makers. Kelly has been invited to speak about her research at Te Whare Kura, the University of Auckland's Indigenous knowledge centre, and has collaborated with University of Auckland academics on both teaching and research to share an intercutural, international perspective. In 2012 Kelly and Emily Juckes (UQ School of Architecture PhD student) collaborated with CSIRO to use their Zebedee 3D laser scanner to digitise a number of Queensland Parks and Wildlife managed heritage sites in Moreton Bay. This has resulted in new techniques for digitising and analysing cultural heritage sites that are large, remote or fragile, and a better understanding of cutting edge digital cultural heritage practices, potentials and challenges gained. Greenop, Kelly and Landorf, Chris (2017) Grave-to-Cradle: a paradigm shift for heritage conservation and interpretation in the era of 3D laser scanning. Historic Environment, 29 1: 44-55. Using CSIRO's Zebedee hand-held laser scanner to record cultural heritage sites in Moreton Bay, near Brisbane, this project seeks to answer questions about how digital recordings of cultural heritage sites can be used to better understand intercultural (Indigenous and settler) places, monitor heritage sites over time, and use the digital 3D point cloud data in new and insightful ways. Pilot projects on Peel Island and Fort Lytton would be expanded and the Bay as a set of places would be considered. A student with experience in architecture, 3D scanning, social archaeology and related fields would be considered and there would be a possibilty of joint supervision with CSIRO staff, expect in technical aspects of the project. This project would involve ethnographic study of migrant families experiences, attachment to, and identification with place. The aim would be to better understand the processes of place attachment and how significance of place is developed for migrants and their communities. Suggested case study sites and communities are Logan's Pacific Islander peoples; Inala's Vietnamese communities; Sunnybank's Chinese populations. This project would carefully investigate Indigenous people's use of houses in urban areas. It would involve careful discussion with household residents about how they use their houses everyday and what they value in them. It may also investigate the materials, design, orientation and energy use of the house, depending on interest of the student. Greenop, Kelly and Memmott, Paul (2016). We are good-hearted people, we like to share: definitional dilemmas of crowding and homelessness in urban indigenous Australia. In Evelyn J. Peters and Julia Christensen (Ed. ), Indigenous Homelessness: Perspectives from Canada, Australia and New Zealand (pp. 270-299) Winnipeg, Canada: University of Manitoba Press. Greenop, Kelly (2015). History receding: the complicity of Australian architecture in colonisation and beyond. In Fiona Foley, Louise Martin-Chew and Fiona Nicoll (Ed. ), Courting Blakness: Recalibrating Knowledge in the Sandstone University (pp. 32-39) St Lucia, QLD, Australia: University of Queensland Press. Greenop,Kelly and Memmott, Paul (2013). Aboriginal identity and place in the intercultural settings of metropolitan Australia. In Evelyn Peters and Chris Anderson (Ed. ), Indigenous in the city: contemporary identities and cultural innovation (pp. 256-281) Vancouver, Canada: UBC Press. Greenop, Kelly and Memmott, Paul (2007). Urban Aboriginal Place Values In Australian Metropolitan Cities: The Case Study Of Brisbane. In Caroline Miller and Michael Roche (Ed. ), Past Matters: Heritage and Planning History - Case Study from the Pacific Rim (pp. 213-245) Cambridge: Cambridge Scholars Press. Zhao, Xiaoxin and Greenop, Kelly (2019) From ‘neo-vernacular’ to ‘semi-vernacular’: a case study of vernacular architecture representation and adaptation in rural Chinese village revitalization. International Journal of Heritage Studies, . Greenop, Kelly (2017) Women to the front. Architecture Australia, 106 4: 65-66. Stead, Naomi and Greenop, Kelly (2016) Reporting from the (Australian) front: housing in extremis. Architecture Australia, 105 5: 30-32. Greenop, Kelly, Juckes, Emily and Landorf, Chris (2016) King George Square's Citizens: social media and the intangible cultural heritage of a Brisbane icon. Historic Environment, 28 2: 26-43. How is crowding in Indigenous households managed? Memmott, Paul, Greenop, Kelly and Birdsall-Jones, Christina (2014) How is crowding in Indigenous households managed?. AHURI Research and Policy Bulletin, 1 180: 1-4. Memmott, Paul, Nash, Daphne, Baffour, Bernard and Greenop, Kelly (2013) Crowded out: a case study of homelessness, crowding and the Tennant Creek Women's Refuge. Parity: The publication of the Council to the Homeless Persons, 26 4: 16-17. Memmott, Paul, Birdsall-Jones, Christina and Greenop, Kelly (2012) Australian Indigenous house crowding. AHURI Final Report, 194 194: i-192. Memmott, Paul, Birdsall-Jones, Christina, Go-Sam, Carroll, Greenop, Kelly and Corunna, Vanessa (2011) Modelling crowding in Aboriginal Australia. AHURI Positioning Paper, i-52. Greenop, Kelly (2008) Inala traditions: People, places and history in urban Indigenous communities. Traditional Dwellings and Settlements Working Paper Series, 216 26-48. Zhao, Xiaoxin and Greenop, Kelly (2016). A preliminary investigation of the rammed earth houses in a vernacular village in China. In: Jian Zuo, Lyrian Daniel and Veronica Soebarto, Fifty years later: Revisiting the role of architectural science in design and practice: 50th International Conference of the Architectural Science Association. 50th International Conference of the Architectural Science Association, Adelaide, SA, Australia, (725-734). 7-9 December 2016. Cordie, Troy, Bandyopadhyay, Tirthankar, Roberts, Jonathan, Steindl, Ryan, Dungavell, Ross and Greenop, Kelly (2016). Enabling rapid field deployments using modular mobility units. In: Australasian Conference on Robotics and Automation 2016, ACRA 2016. Australasian Conference on Robotics and Automation 2016, ACRA 2016, University of Queensland, Brisbane, (107-115). 5-7 December 2016. Greenop, Kelly (2015). Collaborating for heritage at the cutting edge of technology: 3d laser scanning cultural heritage sites in Queensland. In: Daniel K. Brown, Manfredo Manfredini, Peter McPherson, Annabel Pretty, Uwe Rieger and Mark Southcombe, Applied Collaborations: 8th International Conference and Exhibition of the Association of Architecture Schools of Australasia. International Conference and Exhibition of the Association of Architecture Schools of Australasia, Christchurch, New Zealand, (158-166). 2-3 October 2015. Greenop, Kelly, Stead, Naomi and Cheshire, Lynda (2015). Collaborating post-occupancy: teaching and learning across architectural design and sociology. In: Daniel K. Brown, Manfredo Manfredini, Peter McPherson, Annabel Pretty, Uwe Rieger and Mark Southcombe, Applied Collaborations: 8th International Conference and Exhibition of the Association of Architecture Schools of Australasia. International Conference and Exhibition of the Association of Architecture Schools of Australasia, Christchurch, New Zealand, (17-23). 2-3 October 2015. Juckes, Emily, Greenop, Kelly and Jarzab, Zbigniew (2013). Isolation and segregation: an intercultural analysis of the Peel Island Lazaret. In: Alexandra Brown and Andrew Leach, Open: The 30th Society of Architectural Historians, Australia and New Zealand (SAHANZ) Annual Conference. Society of Architectural Historians, Australia and New Zealand (SAHANZ) Annual Conference, Gold Coast, QLD, Australia, (529-542). 2-5 July 2013. Greenop, Kelly (2012). Urban Aboriginal People's Place Attachment and Identification with Remote Home Country in Queensland, Australia. In: Ombretta Romice and Edward Edgerton, Human Experience in the Natural and Built Environment: Implications for Research, Policy, and Practice: IAPS 22 Conference proceedings. International Association for People Environment Studies, Strathclyde University, Glasgow, (292-292). 24-29 June 2012. Greenop, Kelly (2009). Housing and identity in the urban indigenous community: Initial findings in Inala, Queensland. In: Julia Gatley, Cultural Crossroads: The 26th Society of Architectural Historians, Australia and New Zealand (SAHANZ) Annual Conference. Society of Architectural Historians, Australia and New Zealand (SAHANZ) Annual Conference, Auckland, New Zealand, (1-18). 2-5 July 2009. Greenop, Kelly (2009). Place Meaning, attachment and identity in Indigenous Inala, Queensland. In: Perspectives on Urban Life: Connections and Reconnections, Australian Institute of Aboriginal and Torres Strait Islander Studies Conference, Australian National University, Canberra, (). 28th September - 2nd October 2009. Fantin, Shaneen and Greenop, Kelly (2009). Sorcery and spirits: Intercultural housing and place in Aboriginal Australia. In: Julia Gatley, Cultural Crossroads: The 26th Society of Architectural Historians, Australia and New Zealand (SAHANZ) Annual Conference. Society of Architectural Historians, Australia and New Zealand (SAHANZ) Annual Conference, Auckland, New Zealand, (1-13). 2-5 July 2009. Greenop, Kelly (2008). Inala traditions: People, places and history in urban Indigenous communities. In: Nezar AlSayyad, Conference Abstracts for the Twentieth Anniversary Conference of the International Association for the Study of Traditional Environments. Twentieth Anniversary Conference of the International Association for the Study of Traditional Environments, Oxford, U.K., (77-78). 12-15 December 2008. Greenop, Kelly (2008). Uncanny Brisbane: new ways of looking at urban indigenous place. In: David Beynon and Ursula de Jong, History in Practice: The 25th Society of Architectural Historians, Australia and New Zealand (SAHANZ) Annual Conference. Society of Architectural Historians, Australia and New Zealand (SAHANZ) Annual Conference, Geelong, Australia, (1-25). 3-6 July 2008. Greenop, K. and Memmott, P. (2006). Contemporary urban Aboriginal place values in Brisbane. In: C. L. Miller and M. M. Roche, Past Matters: Heritage, History and the Built Environment: Proceedings from the 8th Australasian Urban History/Planning History Conference. 8th Australasian Urban History/Planning History Conference Past Matters, Wellington Campus, New Zealand, (157-170). 9-11 February, 2006. Proceedings of digital cultural heritage: FUTURE VISIONS London Symposium (2019) . Edited by Kelly Greenop and Chris Landorf. digital cultural heritage: FUTURE VISIONS London Symposium., 13-15 November 2017, London, United Kingdom. Proceedings of digital cultural heritage: FUTURE VISIONS (2018) . Edited by Kelly Greenop and Chris Landorf. digital cultural heritage: FUTURE VISIONS, 19-21 April 2017, State Library of Queensland, Brisbane. Greenop, Kelly and Barton, Justin (2014, February 12). Scan, save, and archive: how to protect our digital cultural heritage. The Conversation, . Greenop, Kelly Jane (2012). 'It gets under your skin': Place meaning, attachment, identity and sovereignty in the urban Indigenous community of Inala, Queensland PhD Thesis, School of Architecture, The University of Queensland. Greenop, Kelly Jane (1996). Place and dwelling among the Pintupi People of Central Australia Other, School of Geography, Planning and Architecture, The University of Queensland. This project would involve archival work to map, record and create a database of Brisbane's Aboriginal places from the colonial period, and fieldwork to examine and record the current state of any of these places. This could involve work with other advisors from outside architecture to engage with mapping technologies.